LOS ANGELES – Michael Koncz debunked reports that reigning World Boxing Association (WBA) Welterweight king Manny Pacquiao had sustained serious eye injury during his 12-round title showdown with Adrien “The Runner” Broner last Saturday night. Pacquiao, who successfully defended via unanimous decision his WBA Welterweight diadem against Broner, complained of a slight pain and partially impaired vision involving his left eye after the fight. “The fans have nothing to worry about. It’s nothing serious. After a medical check-up, Manny Pacquiao’s doctor found out that the cornea of his left eye had sustained a light scratch,” Koncz revealed. 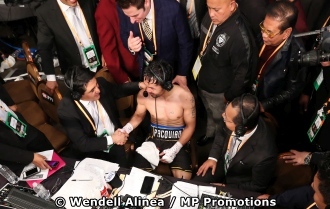 Koncz claimed he was present when Dr. Regina Bagsic of Cardinal Santos Medical Center based in San Juan, Manila, Philippines, checked on Pacquiao’s left eye shortly after the fight. Bagsic, Pacquiao’s personal doctor, watched the fight live at the MGM Grand Garden arena in Las Vegas per invitation from Pacquiao. “Dr. Bagsic went up to the senator’s hotel suite after the fight. After checking on his left eye, she called up an eye specialist in Cardinal Santos Medical Center. Appropriate medicines had been prescribed and were already administered. In five days, his left eye would be okay,” Koncz bared. Koncz dispelled rumors that Pacquiao may have sustained a detached retina, a serious eye injury in which the retina becomes separated from the eyeball, causing loss of vision. According to Medical News Today, detached retina is not usually painful. The source claimed that a detached retina, or retinal detachment, usually only occurs in one eye and is considered a medical emergency. It can be recalled that boxing legend Sugar Ray Leonard was compelled to hang up his gloves after suffering from a detached retina on his left eye. “Many inaccurate reports came out that this is a case of a detached retina. No, it’s not. In fact, the condition of his left eye is fast improving,” Koncz said. On Tuesday evening, Pacquiao even went to the Staples Center to watch live the basketball game between the Golden State Warriors and the Los Angeles Lakers. The Pinoy ring icon is set to fly back to Manila on Thursday, January 24.